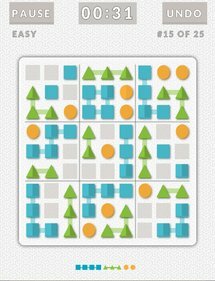 FlowDoku – a puzzle of beautiful shapes, brilliantly arranged. Imagine Sudoku re-invented as a game of colorful shapes, where you use two simple rules and logic to uncover the linked groups of squares, triangles and diamonds. 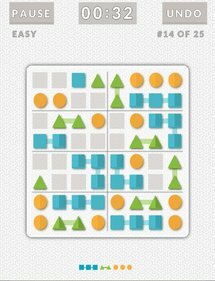 This brand-new, totally original puzzle will keep you endlessly entertained with its simplicity and challenge. Input is a breeze on any size screen with just a few shapes to enter. 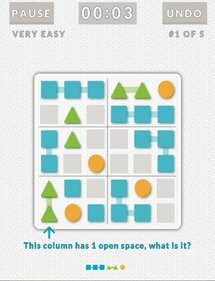 FlowDoku doesn’t require any typing, so you can relax and focus on solving puzzles. 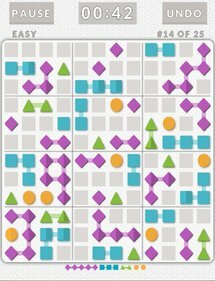 * Totally original puzzle mechanic, not another Sudoku clone! * Quick and simple input (tap to set, or drag to paint). * Clean, colorful graphics, gorgeous ambient soundtrack. * Plays great on both tablets and smartphones. * No numbers, number pads, typing or input modes. * Leave the game any time, and resume later. Every move is saved. * Light and dark themes to fit your environment and preference. * Includes Google Play achievements and leaderboards. Version 1.32 fixes another big performance bug. Thanks to all who reported & helped test this fix! Please upgrade to 1.32 or higher if you’re seeing performance issues. Version 1.31 adds performance improvements, better support for new users, multiple user profiles, a contest offer and bug fixes. Enjoy!